If you happen to be in Venice this week, stop by Chiarastella Cattana’s boutique for a presentation of Character Traits. Friday evening, April 26, 6–9pm, Salizzada San Samuele, San Marco 3216. I have just received the binding mock-up of Character Traits from binder Amy Borezo. Come see it at the Manhattan Fine Press Book Fair on March 10th, or the Oxford Fine Press Book Fair on March 24th and 25th. If you’d like to hear about some of the work that lead up to Character Traits, my lecture, “Making Third Stream Books in the Post-Digital Age,” is now online as a Bodleian Library podcast. 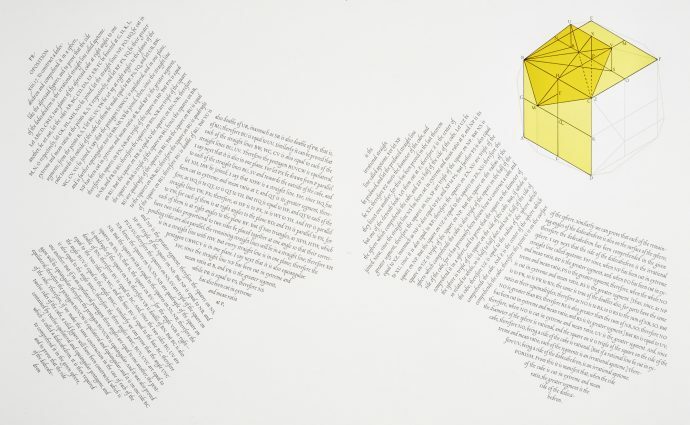 Thinking 3D has featured Interstices & Intersections or, An Autodidact Comprehends a Cube as its item in focus. In the post, I discuss my approach to drawing the diagram for proposition xiii.17 from Euclid’s Elements of Geometry. If you are in New York you can see the actual book at the main branch of the New York Public Library in the exhibit What’s New? Recent Acquisitions. My work appears in two new trade publication this month. 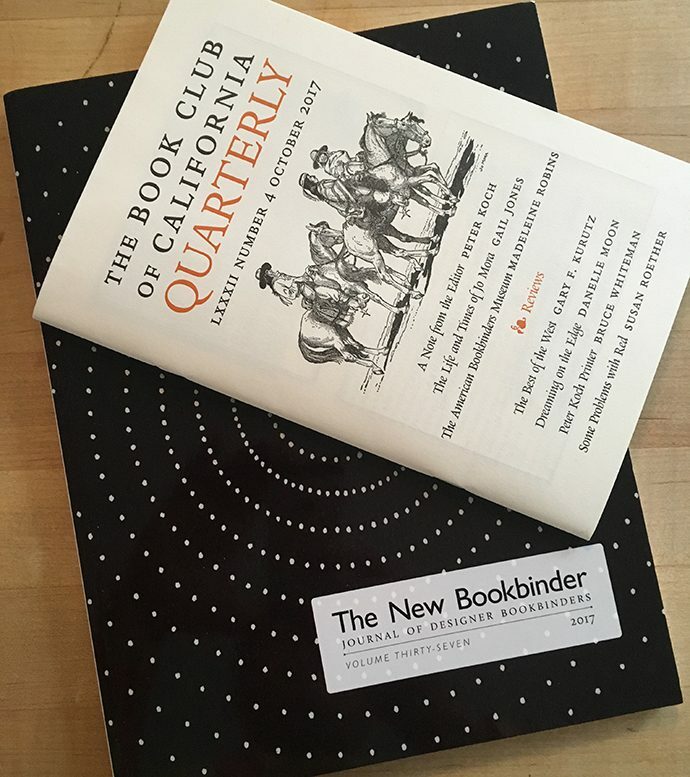 Susan Roether wrote a lengthy, nuanced review of my 2016 book, Some Problems with Red, for the current Book Club of California Quarterly (free with any membership in the Book Club of California); and my article “Letterforms, Alphabets, Typefaces” is out in the “The New Bookbinder” Vol. 37 from Designer Bookbinders, who were kind enough to use my letter O from Linear A to Linear Z for the cover image. 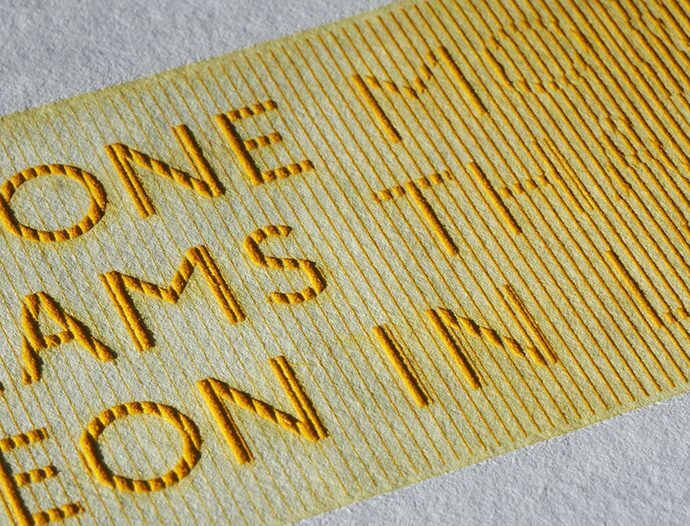 During October I will be the Bodleian Libraries’ Printer in Residence. 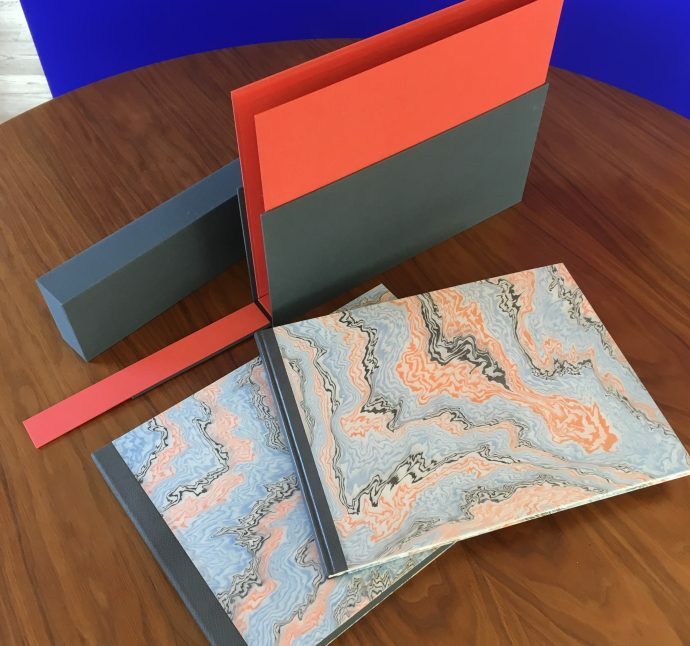 As part of the residency I will be giving a talk titled, Making Third Stream Books in the Post-Digital Age, at 5:15pm on October 17th at the Weston Library Lecture Theatre. For details visit the Bodleian’s webpage. 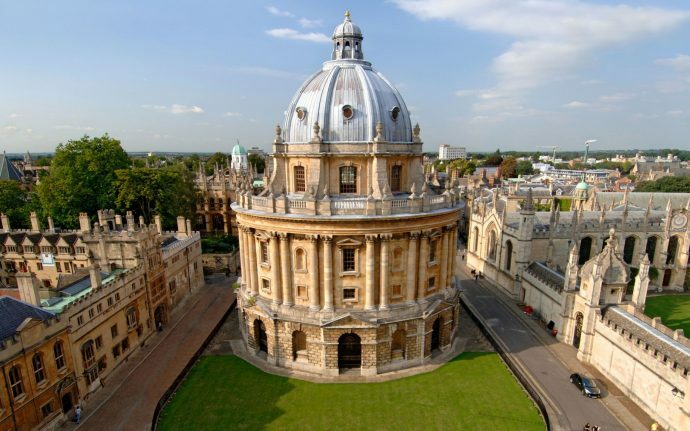 I will also be working at the Bodleian’s Bibliographic Press most weekdays. If you are going to be in Oxford and would like to visit, email me to set up a time. 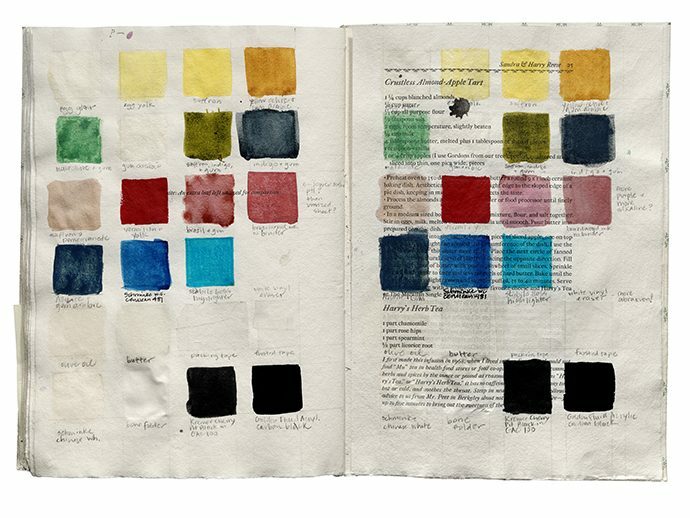 Take a sneak peak at Roma Abstract at the Solstice Book Fair in Iowa City, June 22nd. 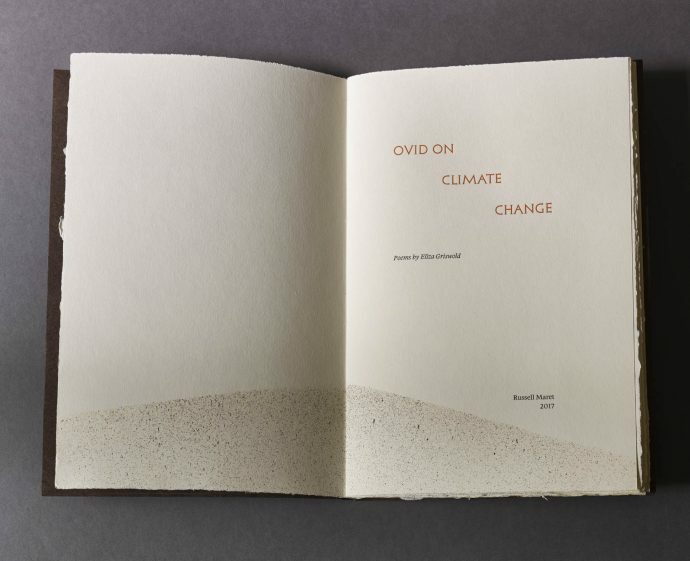 Ovid on Climate Change is now available online. Get it while you can! Used copies of Hungry Bibliophiles will be on display at the University of Iowa Center for the Book, January 21–February 3, 2017. Facsimile copies showing the used and annotated recipes are now available in Books in Print! Above: Maria Frederick’s copy of Hungry Bibliophiles. Announcing a new typographic adventure. A couple of weeks ago I received the “proof of concept” trial letter for my typeface, Hungry Dutch, from the Type Archive in London. Pictured above are the job ticket, pattern, punch, matrix, type, and print from the trial H, all derived from my design. 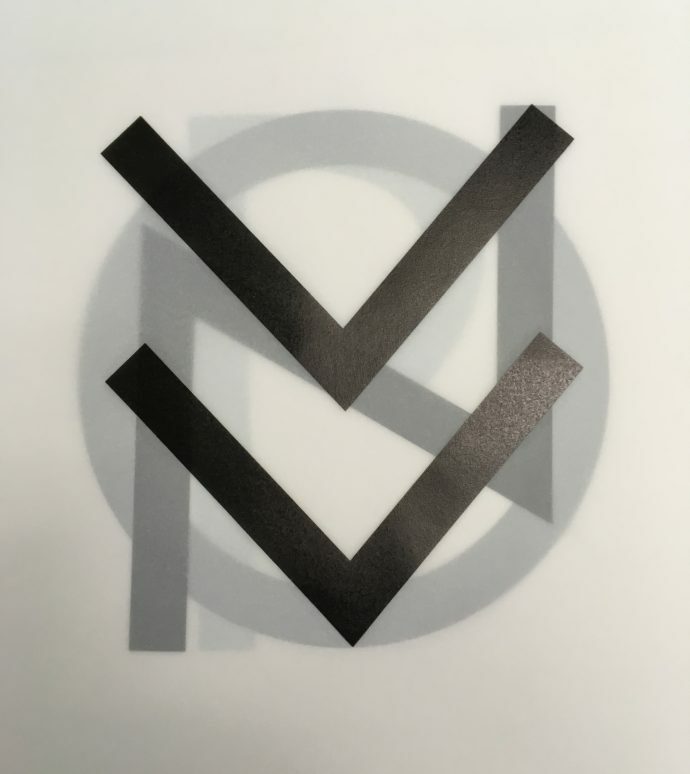 This is the first new design created for Monotype Composition Casters in forty years. There is a detailed post about it in the Books in Print section of the site. I am looking for a few courageous people to sponsor the making of a letter or two, and join me on a journey into the unknown. 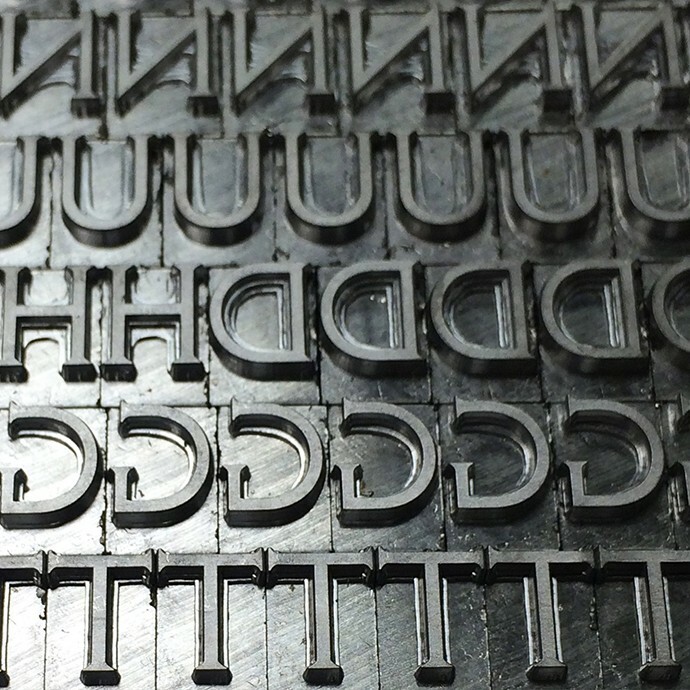 The first casting of my new Baker typeface has arrived from Swamp Press & Letterfoundry. 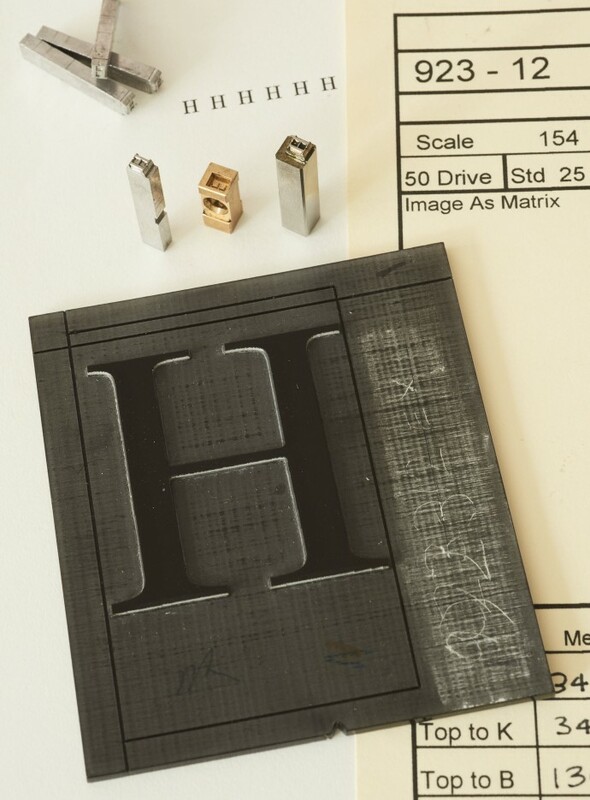 Ed Rayher engraved the 53 matrices and cast the type on a 24pt body, with two 30pt alternate characters. A couple of characters need revision, but finished half-strength jobbing fonts of the type will be available this July. If you are interested in purchasing a font, email me at russellmaret (at) me.com.